Skyline of Business Bay, Dubai as seen from Safa Park. Business Bay (Arabic: الخليج التجاري‎: Al-Khaleej Al-Tijari) is a central business district under construction in Dubai, United Arab Emirates. The project features numerous skyscrapers located in an area where Dubai Creek has been dredged and extended. Business Bay will have upwards of 240 buildings, comprising commercial and residential developments. The infrastructure of Business Bay has been completed in 2008, and the entire development is expected to be completed between 2012-2015. Business Bay is part of the vision of His Highness Sheikh Mohammed Bin Rashed Al Maktoum, UAE Vice President, Prime Minister, Minister of Defence, and Ruler of Dubai. Business Bay will be a new 'city' within the city of Dubai and is being built as a commercial, residential and business cluster along a new extension of Dubai Creek extending from Ras Al Khor to Sheikh Zayed Road. Covering an area of 64,000,000 square feet (5,900,000 m2), once completed it will be composed of office and residential towers set in landscaped gardens with a network of roads, pathways and canals. It will become the region's business capital as well as a freehold city. The entire development covers an area of 46,900,000 sq ft (4,360,000 m2), and the gross leasable area is 78,500,000 sq ft (7,290,000 m2). The projected population of the entire development is more than 191,000, and the estimated population of employers and others is 110,000, making the total population more than 300,000. Commercial development will comprise 2,653,244 sq ft (246,494.4 m2), which is 18.5 percent of the entire development; mixed use development will comprise 8,520,368 sq ft (59.4 percent); and residential development will cover 3,163,628 sq ft (22.1 percent). Business Bay will cost AED 110 billion (USD 30 billion). The Executive Towers at Business Bay consist of 12 towers, which includes residential, commercial and office towers. These are the first buildings to be completed in Business Bay and are located near its entrance. A three-storey podium connects all the towers in addition to the nearby Vision Tower, which is going to be connected by a special passage. Bay Avenue is an arena of two levels of indoor and outdoor retail space. It will have cafes, restaurants, boutiques, showrooms, plazas, children’s play areas,and sporting facilities. However, nearly two years after completion, the first couple of shops are only nearing completion. Dubai Creek Extension is a part of the Business Bay development. The plan involves the expansion of the current 14 km long Dubai Creek to 26.2 km. Dubai Creek will be extended from its original place to Business Bay to the Persian Gulf through Safa Park and Jumeirah. The project will be carried out in three phases. Completion was scheduled for 2007, but is now expected by the end of 2010. Some 10 kilometres of the total 12.2 kilometres of the Dubai Creek extension work has already been completed in Business Bay. 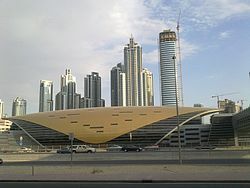 Business bay is connected to Red Line of Dubai Metro with Burj Khalifa and Dubai Mall station and Business Bay Station, which opened on 25 April 2010, together with most of the remaining stations of Dubai Metro's Red Line. There will be over 230 towers in the Business Bay district. This list has 32 projects, covering 44 individual towers. 1 JW Marriott Marquis Dubai Tower 1 355 (1,165) 77 2012 Tallest hotel in the world. 19 Bay Central 2 180 (591) 40 2012 Under construction - building was topped out in 2011. ^ a b c d "Master Plan". Dubai-properties.ae. Retrieved 2010-09-30. ^ "Business Bay, Dubai, United Arab Emirates". Business-Dubai.com. Retrieved 2015-10-18. ^ "Business Bay". Area Guide | propertyfinder.ae. Retrieved 2019-02-06. ^ a b JW Marriott Marquis Hotel Dubai. "JW Marriott Marquis Hotel Dubai: Dubai Luxury Hotels". Marriott.com. Retrieved 2012-12-15. ^ "Emirates Park Tower 1". SkyscraperPage.com. Retrieved 2012-09-17. ^ "Emirates Park Tower 2". SkyscraperPage.com. Retrieved 2012-09-17. ^ "Ubora Tower 1". Emporis.com. Retrieved 2012-09-23. ^ "U-Bora Tower 1". CTBUH. Retrieved 2012-09-23. ^ "The Vision Tower". Emporis.com. Retrieved 2012-08-17. ^ "Vision Tower". SkyscraperPage.com. Retrieved 2012-08-17. ^ "Churchill Residence". CTBUH. Retrieved 2012-08-23. ^ "Churchill Residency, Dubai". SkyscraperPage.com. Retrieved 2012-08-23. ^ "The Bay Gate". Emporis.com. Retrieved 2012-09-17. ^ "The Bay Gate". CTBUH. Retrieved 2012-09-17. ^ "Executive Tower M | Buildings". Dubai /: Emporis. Retrieved 2012-08-21. ^ a b "The Citadel". Emporis.com. Retrieved 2008-04-12. ^ a b "The Citadel". SkyscraperPage.com. Retrieved 2008-04-12. ^ "Horizon Tower". Emporis.com. Retrieved 2007-11-12. ^ "Horizon Tower". SkyscraperPage.com. Retrieved 2007-11-20. ^ "Platinum Tower". Emporis.com. Retrieved 2007-11-12. ^ "Al Shafar Tower". SkyscraperPage.com. Retrieved 2007-12-01. ^ "Executive Tower B". Emporis.com. Retrieved 2012-09-29. ^ "Executive Towers Building B". SkyscraperPage.com. Retrieved 2012-09-29. ^ "Lake Terrace". Emporis.com. Retrieved 2008-07-18. ^ "Lake Terrace". SkyscraperPage.com. Retrieved 2008-07-18. ^ "Sidra Tower". Emporis.com. Retrieved 2008-04-14. ^ "Sidra Tower". SkyscraperPage.com. Retrieved 2008-04-14. ^ "Dubai Tower". Emporis.com. Retrieved 2012-09-18. ^ a b "Bay Central 2". CTBUH. Retrieved 2012-09-18. ^ "Mazaya Business Avenue 1". CTBUH. Retrieved 2012-09-18. ^ "Mazaya Business Avenue 2". CTBUH. Retrieved 2012-09-18. ^ "Mazaya Business Avenue 3". CTBUH. Retrieved 2012-09-18. This page was last edited on 16 April 2019, at 08:34 (UTC).